Sound is described by two variables: frequency and loudness. We measure both variables when we test hearing. These two variables are then plotted on a graph called an audiogram. 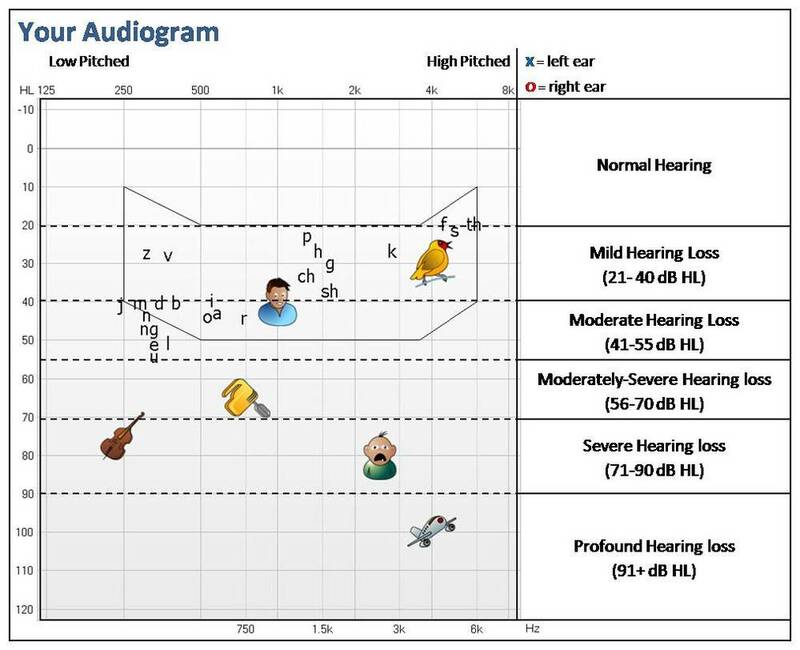 An audiogram is a graphic representation of your hearing ability. During a hearing test, your hearing is checked at different frequencies to determine the softest level you can hear at each frequency. The horizontal scale at the top and bottom indicate the different frequencies, or pitches. The low frequencies (e.g. the hum of an engine) are located on the far left and the high frequencies (e.g. the twitter of a bird) on the far right. This is similar to a piano’s keys from left to right; low pitch to high pitch. The frequency or pitch of a sound is measured in kilohertz, abbreviated as kHz. The vertical scale indicates the loudness level of the respective frequency, from soft (top) to loud (bottom). Values are given in decibels, abbreviated as dB. The healthy human ear begins to perceive sounds starting at 0 dB and reaches the threshold of pain at 110 dB. Speech consists of vowels and consonants at different loudness and frequency levels. The octagonal shape on the audiogram is referred to as the "speech banana" which essentially encompasses most of the speech sounds.